rec. 18-21 October 2013, Beethovensaal, Hannover. With two piano concertos, four sonatas and a quantity of other works for the instrument, Allen Shawn's affinity for and association with the piano is well established, and the confident opening of the Five Preludes immediately puts us somewhere where we know we are in the safe hands of an expert craftsman. The synergy between pianist and composer is also palpably in evidence from this recording. 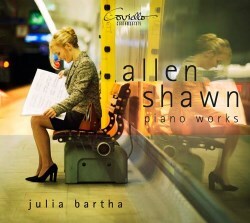 Swawn and Julia Bartha have an artistic relationship and friendship that has endured for many years, and the Fourth Piano Sonata is indeed dedicated to Julia. Allen Shawn writes on his own music in the booklet notes. The Five Preludes were written for pianist Elizabeth Wright, these strikingly effective pieces responding to her "powerful technique [and] extraordinarily resonant, beautiful piano sound." Virtuosic brilliance and expressive depths are both explored here, and the name Prokofiev is thrown out as something of a connection with some of the material. The power of the Demonic last prelude certainly invokes this Russian-ness, with thematic integrity and tonal structure making each piece a compact masterpiece in its own right. As you would expect, the Jazz Preludes give a more relaxed impression. These explore jazz influence but are by no means a pastiche, intriguingly using familiar pianistic gestures as thematic elements. These are "serious concert pieces" and go much further into sometimes darker realms than their title might suggest. 'Jazz' here can be both stride style and a music seen through a double prism, absorbed through the way jazz influenced 20th giants such as Stravinsky and Ives. Recollections is another work written with a specific pianist in mind, in this case the "great elegance, impeccable technique and power in reserve" of Daniel Epstein. Composed in three movements, Recollections has a more abstract feel than the previous works, introducing mystery and a rather intangible sense of dramatic mood. Shawn himself indicates hints of Rachmaninov in the first movement though this is something that wells up from deep within, coming out in pianistic virtuosity rather than tonal or melodic associations. Dissonance here and in the second and third movements might also suggest Schoenberg, the "vexed, disquieting mood" of the central movement dispersed by the stunning dancing rhythms of the last. The Piano Sonata No. 4 "was a fortunate convergence of a focussed sense of intention and clarity of design." Originally intended as a two movement piece with the slow movement as a finale, the third movement something that "presented itself as a musical necessity" and something of a surprise. The first movement thoroughly works out its ideas and is much more than just an introduction to the second, though it is here that the magic really happens. This builds a remarkable intensity over its seven and a half minute timespan, holding us tightly in its spell until the release of the energetic and relatively brief finale. This is a piece with abstract fascination which is slightly undercut by the more pictorial last movement. I can hear where the trail needed a more concrete ending and this is indeed very effective, but the last movement seems a bit too 'fruity' for the rest. Valentine is a musical gift that "almost has the character of a slow Ragtime, but also owes something to Brahms." Growl on the other hand is "a jazzy and tautly constructed atonal outburst." The programme concludes with Three Reveries, music that Shawn associates with a "strangely calm, small lake by a forest" at which he took time to reflect at a time of change in his life and that of his family. Rather than closing with fireworks, we are left on notes of poignancy and thoughtful contemplation. Superbly performed and recorded, this is music that commands and deserves our attention. Allen Shawn is by no means an avant-garde composer, but the sheer quality of his personal voice has its own magnetic clarity, taking us to musical spaces both exciting and beautiful without resorting to cliché.